Yes, there shall perhaps be two! Not that exciting as far as pattern goes, but the yarn sure is pretty! 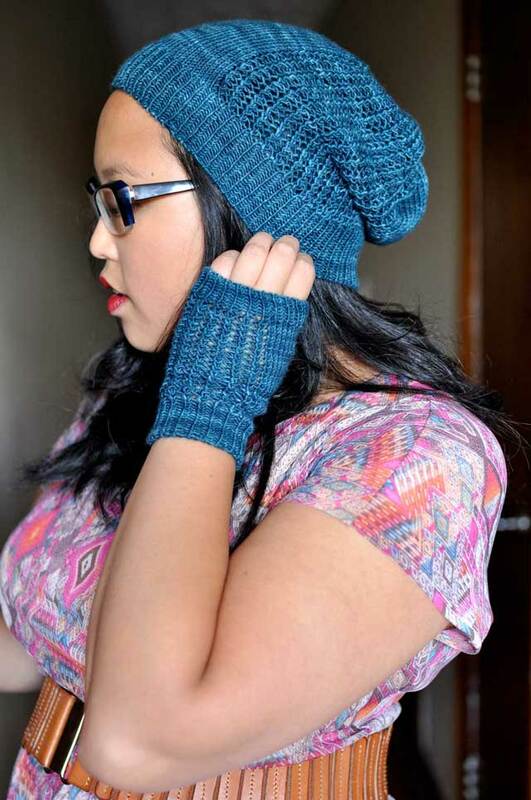 This one’s the Knitting Pure and Simple Neckdown Wrap, in Dream in Color (“dusky aurora”). I think I started this one about two weeks ago, and have mostly been working on it while in the store. 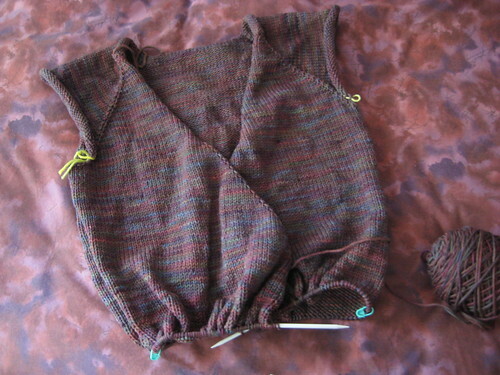 I’m actually farther along now – the body is done, one sleeve is done, and the other sleeve is halfway there. So that leaves half a sleeve, the neckband, and ties to go. Just half a sleeve and a good blocking to go. Go go go! Oh. my. That colorway of DIC is beautiful. It will be such a lovely, softly shaded wrap. Yummy! The color on the first sweater is stunning. I like wrap sweaters too, they are always so flattering. Can’t wait to see them both done. Wow, that second sweater is Noro Silk Garden? What a lovely colorway! I haven’t seen it before. Both sweaters are great! I’m love love loving the undyed Noro Silk Garden! I’m getting the concept of the Silk Garden sweater now. Looking forward to seeing it modeled. they may look like simple sweaters but i believe that it’s the basic ones that get loved and worn the most! i can’t wait to see how the silk garden one turns out. great idea! These both sweaters are really beautiful! I’m really curious of the construction of them, will you write up a pattern or a tutorial? They are really insteresting! I didn’t talk about the colors but, they are great too! I really like your knitting blog! It’s always beautiful and interesting! That Noro is yummy – so different! i’ve been reading your blog for a few months now, and the wonderfulness of the online knitting community has prompted me to finally start my own blog — thus, time for me to delurk. i have had a hard time understanding the seemingly universal appeal of noro, but that natural colorway is beautiful. looking forward to seeing the completed wrap sweater! Hi! Does this mean you will be at Rhinebeck for two days, or will you alternate sweaters – like they used to tell us to do with our shoes (Did anyone ever take that advice – buy two identical pairs of shoes and alternate them throughout the day? I thought not.). 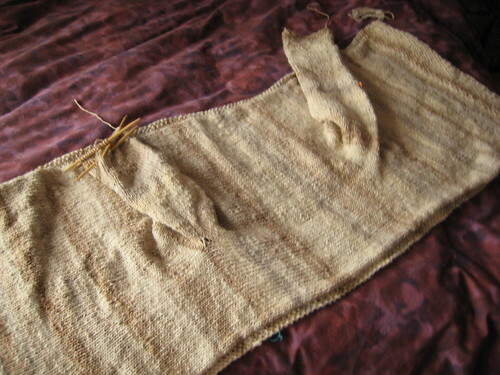 I am driven to start looking for a wrap sweater of my own – but not by the weekend. I will be the embarrassed looking person wearing polar fleece! Wow, what a coincidence! I also have the Pure and Simple Wrap on the needles, in almost the same place! I love the colorway you have chosen, and its name is so fitting . . . Dream in Color. Happy knitting!